Open Monday to Sunday 7 days a week. 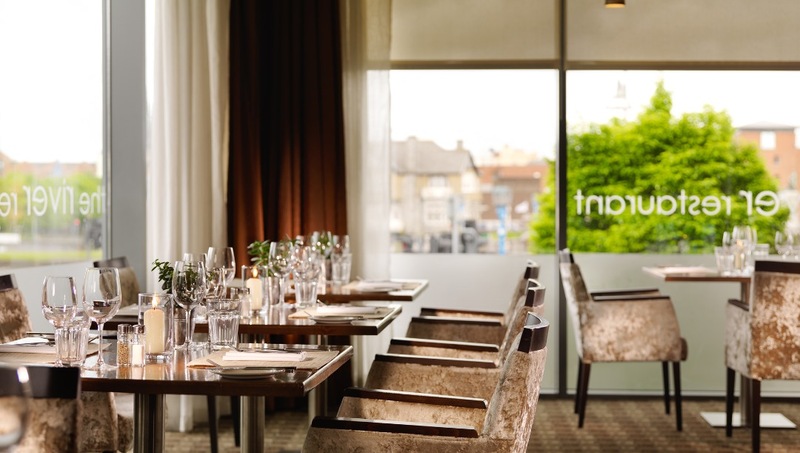 The AA rosette River Restaurant at the 4* Limerick Strand Hotel offers a truly special dining experience overlooking the magnificent River Shannon. 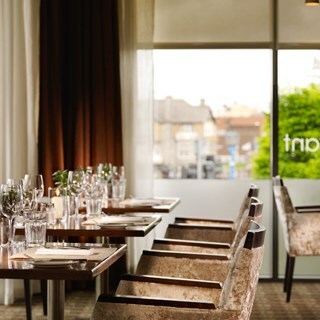 Our team, the menus, the setting and above all the food ensure that The River Restaurant is considered to be one of the finest restaurants in Limerick City. Executive Chef Tom Flavin & his wonderful team of chefs focus on surpassing the expectations of our guests by using the freshest local ingredients where possible in all our dishes. Expertly prepared then served simply & fresh, you can really taste the place. We are fortunate to be living right in the middle of the Wild Atlantic Way and in the heart of the Golden Vale with some of the best raw ingredients in the world & a great larder for our kitchen team. Our menu reflects a passion for high quality locally grown produce. We partner with local farms & dairies where ever possible to source the finest fresh ingredients which allow us to take pride in our unique menu. We use real, fresh, high quality, locally produced, seasonal food that is healthy for people and makes Ireland’s food industry the best in the world. Soups, sauces, gravies & dressings are made fresh from our own recipes, most of which have no added Gluten. Offering guests a pure taste of the Wild Atlantic Way we work extra hard to support local artisan producers hence offering a dining destination that has the heartbeat of Limerick city. Great choice of dishes and friendly and helpful staff. A pleasurable dining experience. not very pleased with service, or the change of menu,  which is pricey. Our main course took 40 minutes after ordering, for it to arrive, wrong order was sent to our table, then taken back..
Really enjoyed Mothers Day buffet. Would highly recommend. Great selection of food. Friendly, helpful service. Absolutely fantastic day at river restaurant! Could not recommend it enough, food was amazing, staff were amazing excellent service all round would definitely return again. table not properly set ..we has to request side plates.. Varied choices and good tasting food. Staff friendly and efficient. The food and service was excellent on Saturday night but my god the fresh cream cake was to die for. Breaks between each course was also well planned. I would definitely recommend the restaurant as a choice for a family occassion. Had a great night the meal was lovely & the staff were all very friendly & helpful i would go back again. AN AWFULLY NICE LUNCH, AMONG AWFULLY NICE PEOPLE, IN AN AWFULLY NICE SETTING! AND AN AWFULLY NICE GLASS OF GLASS OF PROSECO. Beautiful meal thoroughly enjoyed by everyone. I would highly recommend River Restaurant. The service was wonderful  and the waiter who looked after us could not have been more helpful. We will be back! Great Sunday lunch. A place to take visitors to. Friendly staff; good selection of food. Highly recommend. Excellent buffet. Took us quite by surprise. Excellent fish, not overdone, beef really tender, variety of entrees.. Desserts likewise - abundant, various, and flavourful. Waiter so friendly and vigilant. We will definitely visit you again before too long. Food is really good. There was a young man looking after us at the table and he was excellent making sure we had water and even changing a place setting when we spilt drink. Prosecco is a lovely touch. Some music would be nice. Beautiful food, lovely staff, wonderful location and atmosphere. Just wish I had an even bigger appetite!! The food was great....however we were attending as a communion party and it was 1 1/2 hours after we were seated before we received our starters. The kids were hungry so they made a start on the buffet which meant the were finished ages before us and became bored. There was also supposes to be a magician present in the day...but there was nnothing sign during our sitting.